The police harshly beat the women and children who were standing in quiet protest, they simply beat women and children…I stood alongside a woman who was beaten by four police officers, actual fists in her face, ears and neck, in addition to kicks until she almost lost consciousness…people are sitting on the ground, in the rain, and not moving, women and children. The police shot stun grenades and foam bullets directly at the women, at point blank. The Bedouins of al-Arakib comprise a few hundred of the more than 100,000 Bedouin citizens of Israel living in the Negev. Nearly half of the that population live in villages that the State of Israel doesn’t officially recognize. Unrecognized villages are not connected to the electrical grid, water mains, or trash pick-up and sewage systems. Many are calling the demolitions in al-Arakib the “ethnic cleansing of the Negev Desert.” Demolitions carried out by the Israel Land Administration are made possible by the overwhelming presence of Israeli riot police and their gross use of force. The demolitions are an attempt to Judaize more territory in the Negev by forcing Bedouin residents off their ancestral land and into the towns that Israeli created in the late 70’s/early 80’s for the purpose of concentrating the Arab Negev population. In the most recent demolitions, activists reported that the bulldozers that razed the dwellings and animal enclosures were not Israel Land Administration equipment, as used previously, but were marked as belonging to the Jewish National Fund (see here and here for harrowing video of previous demolitions). The Jewish National Fund (JNF) was established in 1901 to purchase land from the Ottoman Empire for the purpose of Jewish settlement. After the establishment of the state of Israel, the JNF morphed into a non-governmental/governmental hybrid. 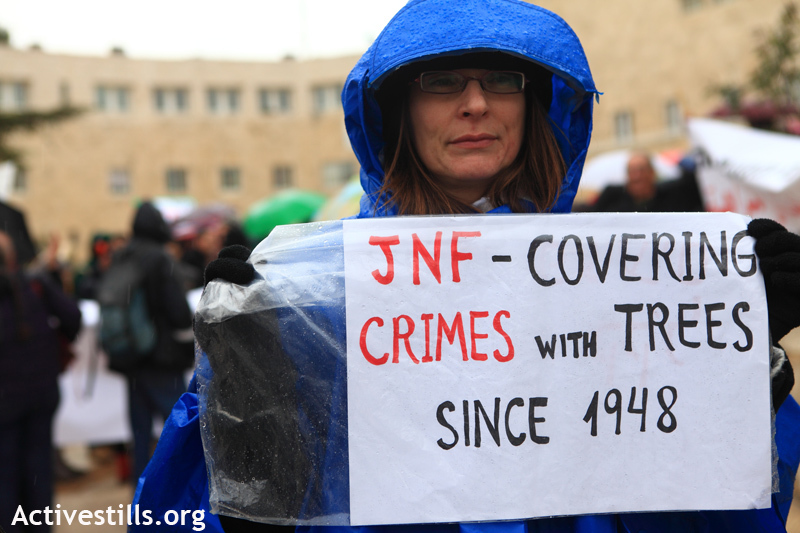 Today, the machinations of the JNF are virtually indistinguishable from the aims of the Israeli state. Throughout its history, the JNF has has used tree-planting as a technique to demarcate Jewish land. Along with the judaization of the land through tree-planting often comes the physical erasure of any memory of Arab inhabitance. An example of the latter was the afforestation of Arab villages whose residents fled amidst the violence of 1947-1948 that prefaced the birth of the Israeli state. This event is referred to in Arabic as the nakba – the catastrophe. In al-Arakib, the JNF is using demolitions and afforestation for the same purposes as it has for decades – to cleanse the land of Arabs by creating a forest, and thus disallowing Bedouin residents from returning to the land they claim they have owned since the early 20th century. As if the plot needed to thicken, GOD-TV, an international Christian television broadcaster boasting a half a billion viewers, has donated 1,000,000 saplings to the JNF. GOD-TV programming encourages viewers to “sow a seed for God” but GOD-TV and its viewers are, in fact, funding the uprooting of Bedouins from their ancestral lands. Palestinians, Israelis, and internationals have voiced their opposition to the demolitions through their ongoing presence with the residents of al-Arakib in addition to organizing numerous demonstrations in the Negev, Jerusalem, and Tel Aviv. Activists gathered outside of the JNF Jerusalem offices on 1 February 2011 to protest the attempted displacement of al-Arakib residents.